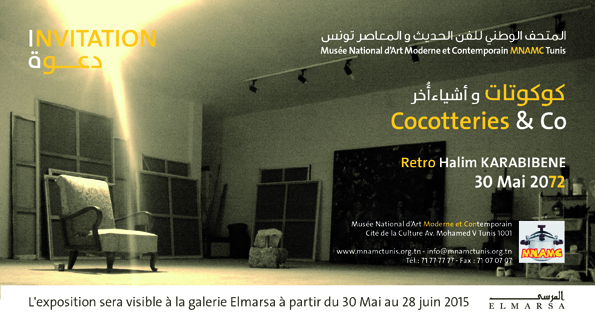 This solo exhibition is part of the serie of events organized by the artist since 2007 in the name of the National Museum of Modern and Contemporary Art, the MNAMC of Tunis, a museum that doesn’t exist, or not yet ! But this time, it’s the artist who invites himself to the museum, auto-exhibits, and does his “auto-curating”, drawing from the collection and archives of the “MNAMC”! A kind of fiction, but with real artworks, skillful and versatile, created during the confused period that Tunisia went through, and is still enduring since the end of 2010. 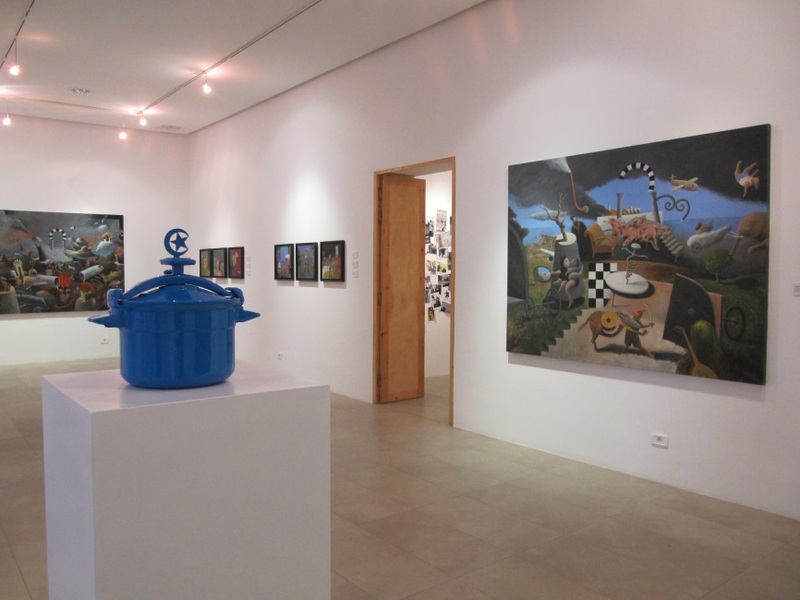 As a “Transdiscipliné”, Karabibene presents his prolific work who travels “between” techniques, cities and time. Paintings, etchings/prints, photographs, installations and videos made between Bizerte, Paris and Berlin. 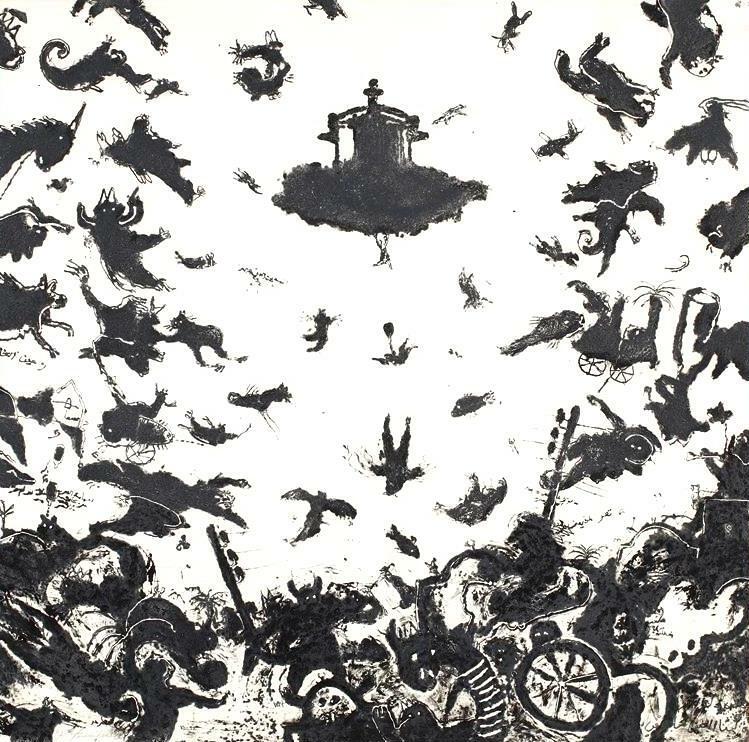 Artworks tracing his “Donquichottesque”, artistic and funny battle for the existence of the “MNAMC”, armed with his pressure cooker permanently on the verge of an explosion. 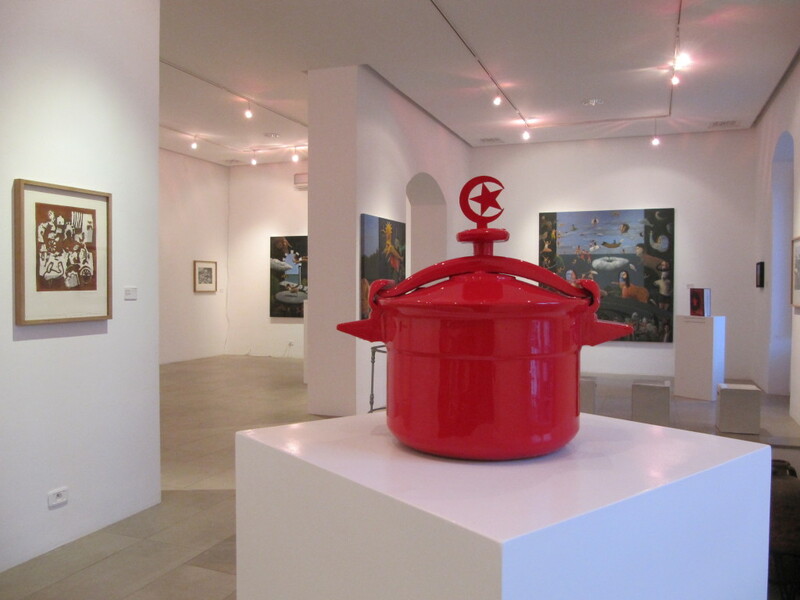 Pressure cooker that was the shape of the futuristic museum, – meant to have existed in 2069 – and which became, after the “Revolution”, the symbol of a high-boiling Tunisia and a support for Karabibene’s visual research. The alchemist-artist’s laboratory-cooker “Master of the fire and the valve”, always boiling and bubbling, whistling, pitching on the flow of events. He shows paintings and prints/etchings which left a mark on his return to the “Studio”. A return to himself, inward, after the earthquake, the street life call and the excess of reality. An excess which was revisited to be «trans-deformed”, bringing him back to his “Onirealistic” world and his unrestrained pictorial fictions. Halim Karabibene as a museum curator also, presents pieces of the monographic archive of “Karabibene” that the National Museum of Modern and Contemporary Art of Tunis is supposed to be holding. Life marks, sketchbooks, exhibition catalogues, press articles… All museographic resources, which will make the coming catalogue – currently empty –, are to write a story, a history, that wasn’t only fiction. Conversation with Halim Karabibene and Christine Bruckbauer 30.05.2015.